Even though I got no credit for anything I did today, I really wanted to write here about how I spent an entire day chasing a piece of paper. It is also of value to express how the government does not seem to know what to do with people who do what they are told. My original log sheet for community service hours “expired” on November 1. They give log sheets that expire periodically so that you have the option of failing to renew it and then having to pay a duplicate fee for the same volunteer work. Yes, the state charges you to do your community service. He concluding our conversation by asking about my animal riding charge. 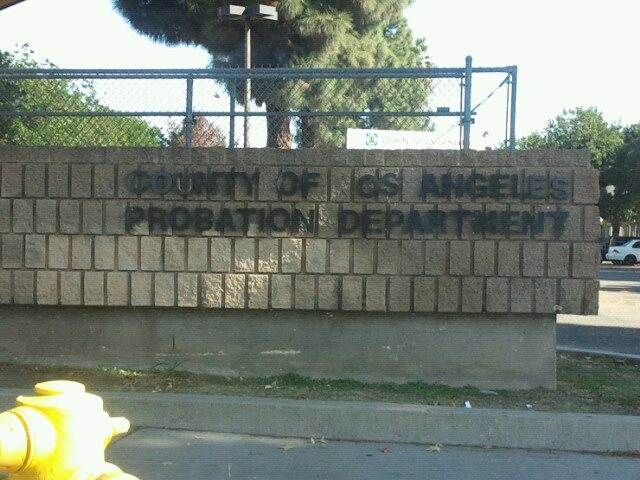 The last time I checked in for probation I went to the central probation office. They told me that since I don’t have an officer yet and since my case is being transferred to Orange County (where I lay my head at night), I should go to the Rio Hondo probation office in Whittier since it is closest to where I am staying. So– and I know this entry has been clear as mud so far– I drove to Whittier from downtown where the community service office is. After driving to downtown from Anaheim to begin with. The Rio Hondo office was cleaner and smaller than the central office. My hopes rose for a split second that this was a sign of life. After waiting over 40 minutes, a chubby woman yelled my name from a side door. Relieved, I rushed over at her with all my paperwork in hand. My plan was to get the approval from her and then take it back to downtown to get my new timesheet. She looked at me like I was from the far end of the galaxy. And with that she slammed the door in my face. I got a distinct feeling that someone was being lazy. I have found the cervix and diagnosed it as incompetent. Upon arriving 20 miles west in congested traffic, I walked in the central probation office trying not to cry. I walked up to the check in window and explained my dilemma. Apparently, he hadn’t gotten the memo. For the fifth (sixth? seventh?) time, I explained my need for an extension to continue doing my community service. He reviewed the paperwork and suggested I just not do it until later on in my probation. I tried to remain respectful. Finally he said he’d have the officer of the day assist me. “Just have a seat.” he grumbled. Another 20 minutes and an grey haired woman called my name. She allowed me to come back to where he desk was so she could finally help me. This occurred at hour SIX. It finally occurred to me that every probation officer walked behind me. It also occurred to me that most of the VOA staff walked behind me. It began to dawn on me that it was impossible for me to attack them this way. Better leave my nunchucks at home. I once again explained my issue. This officer was a little bit slow so I explained it repeatedly. I was at her desk for almost an hour. I finally left with a paper in hand that she wasn’t sure was what they wanted. Good to feel like seven hours of your day was spent on something concrete and well researched. I trembled inside at how I would take the resistence from the community service office if this was the wrong paper. Fortunately, my fears did not come to fruition and I finally had the paper I needed an hour later. It was a well achieved goal, after all I had spent eight hours trying to acquire it. My friend Debbie came for a lunch visit today. Debbie is black. She was also accosted on the short walk from her parked car to the shelter. She didn’t even make it before she had to kick someone, or, as she put it “defend myself from my own people.” So she turned around and went back to her car and picked me up in her vehicle. Poor girl couldn’t find her way out of a basket. She was so lost in skid row. I finally directed her away from a throng of street dwellers who seemed very interested as she drove by slowly. Eventually she caught sight of me and her smile lit up the entire street. “Tell your friend to quit smiling so much.” Matt sarcastic poked fun as I left the shelter behind for a moment. So strange to see a member of my old life pushed up against the backdrop. She seemed a little shocked. I thanked her for taking the time. She said everyone should see this. We pondered all the various reasons… Katrina, lack of education, neurological predispositions to various drugs. But nothing seemed to fit the bill. After she left it occurred to me. Almost everyone here has a record. And now I’m convinced I’m partially looking at the end result of racism in the criminal system. Yes, the chicken may indeed come before the egg. The cause and effect needs to be looked at from the opposite perspective to connect the telling dots. I saw the same thing in jail. Almost everyone was black there too. And the defendents in the courthouse… at least the ones with a yawning court appointed attorney. And now the shelter staff looks shinier against that back drop. Most of them are survivors as well as felons. And they’ve found the will to turn around and make a difference. Not a difference for everyone, or even most, but a difference in some. A difference in a few. Hell, even a difference in ONE is an eternal reward. An 82 year old man walked on the grounds and proclaimed himself homeless. I have a hard time telling the age of black men. They have this perpetual youth thing down. I would not have thought he was as old as he was if he didn’t tell us. Perhaps the fact that he walked with a cane and was slower than the other men would’ve given me a hint. Another older client gawked at his age and told us that he didn’t want to live to be 82. He philosophized that growing that old means that all your loved ones are gone. He said he doesn’t want to say goodbye to everyone and be all alone. It’s this positive attitude that makes the staff glow. Eventually Eric came out and met with him. He spoke kindly to him and slowed with the respect children are rightfully taught to show their elders. The fact the man was even homeless was a shame on all of us. Eric slowly walked him to his office and found him a safe place to go for shelter. And with that I began to see that these case workers are doing the work of all of us.